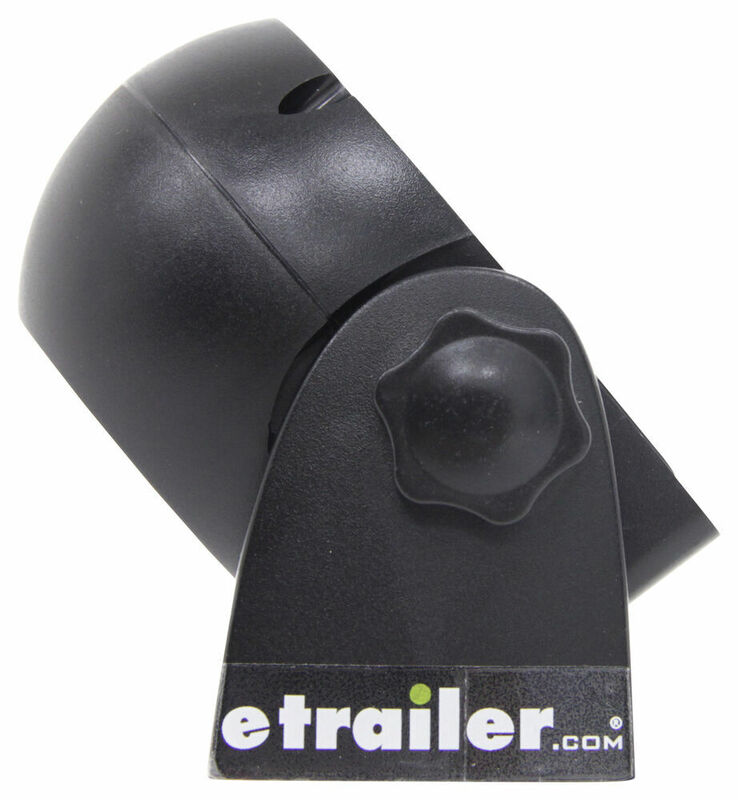 Call 800-298-8924 to order Rear View Safety Inc backup cameras and alarms part number RVS-83112 or order online at etrailer.com. Free expert support on all Rear View Safety Inc products. 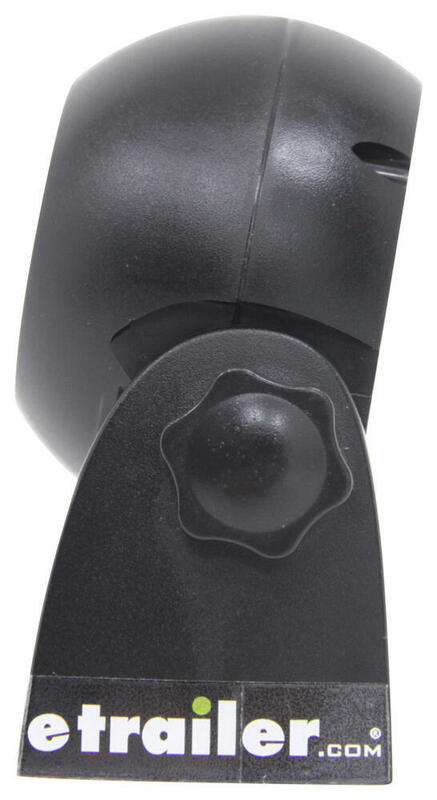 Guaranteed Lowest Price and Fastest Shipping for Rear View Safety Wireless Hitch Camera. 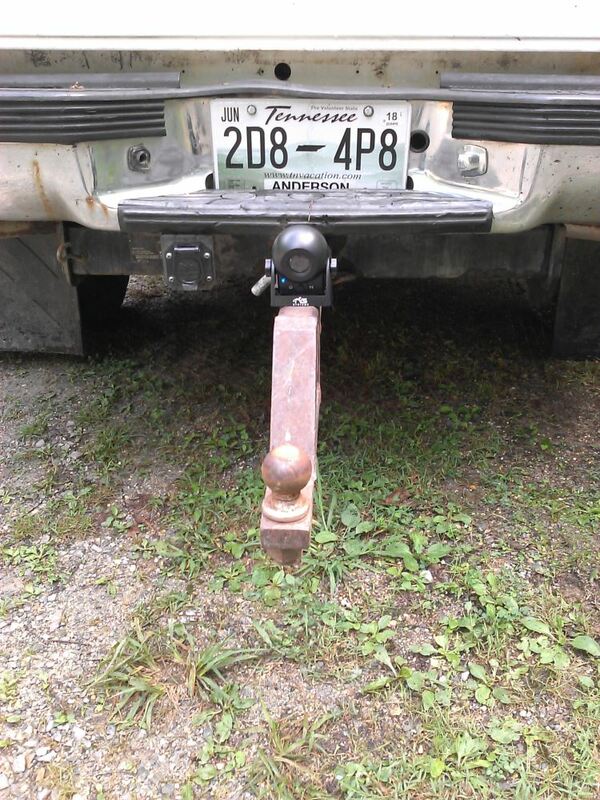 Backup Cameras and Alarms reviews from real customers.
. take a look at the Rear View Safety Wireless Hitch Camera. Now, this part will include everything shown here on the table. 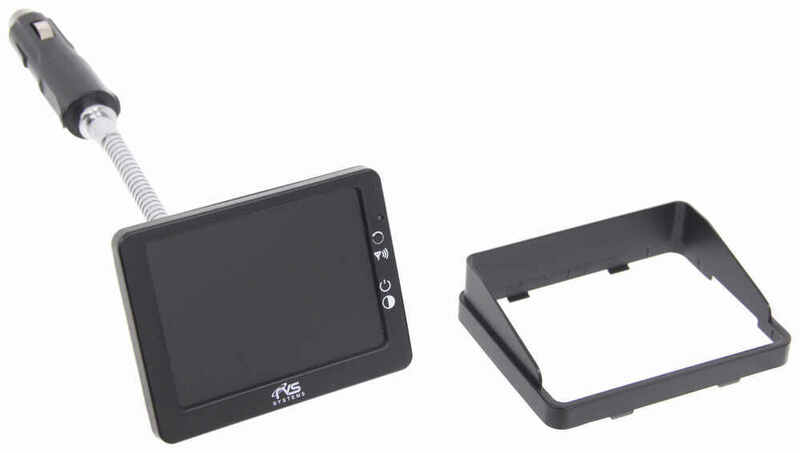 It includes the wireless camera, the full color monitor, nice instruction manual, and a piece of hook and loop fastener for alternate mounting. 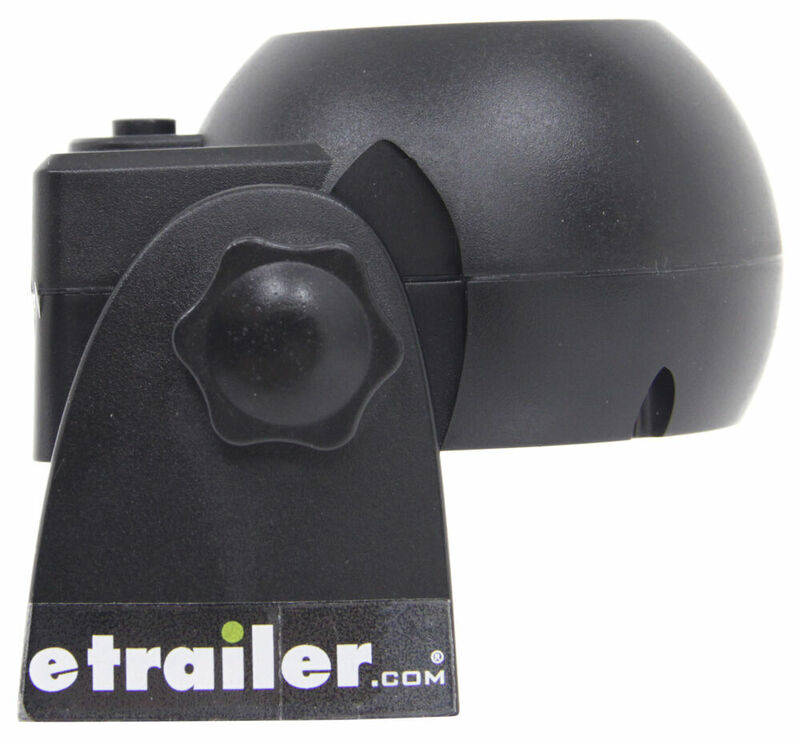 This small, magnetic, wireless camera makes it very quick and easy to hook up to your trailer. There's no wiring, it's just a plug in place system. It's ready to use in under one minute. 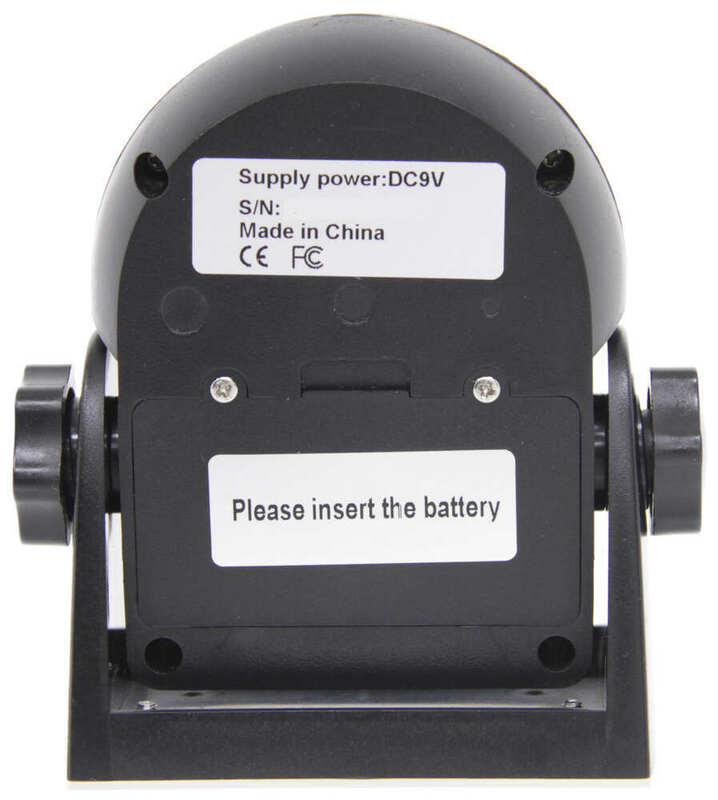 Basically you just attach your camera to your ball mount and then plug this into your twelve volt power supply and you'll have your monitor in your cab. I did happen to pull a ball mount with the ball on it just to try to give you a demonstration here. What you would do .. You can see that it attaches to the ball mount. Just point it down towards the ball, and then again, plug this into your twelve volt power source. Turn on your monitor, and you'll be able to see to hitch up, makes it very easy to do. 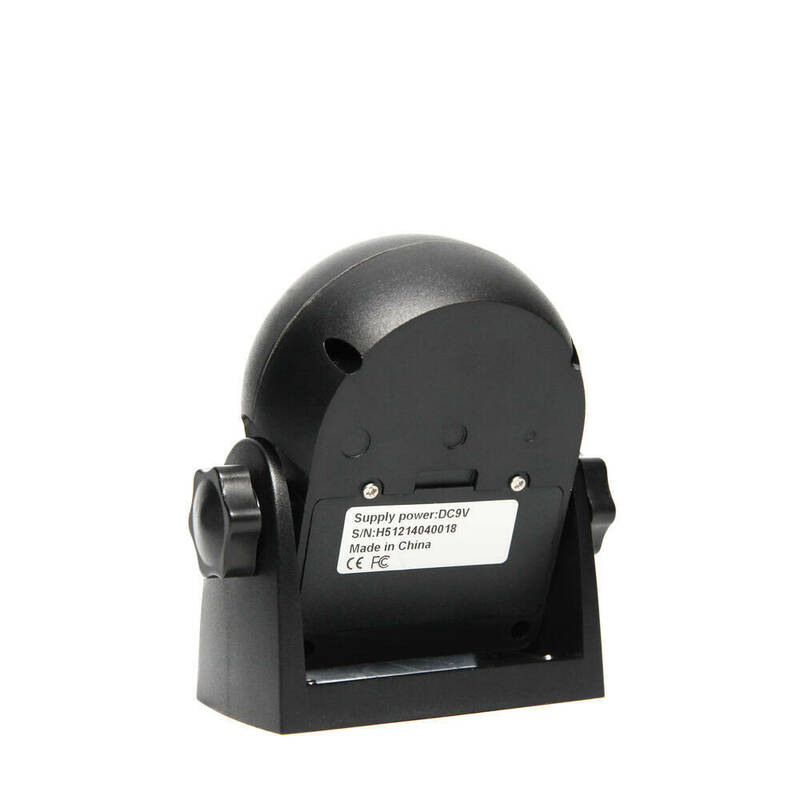 Now, this does use wireless connectivity, which is digital, provides an uninterrupted connection for distances up to seventy feet, because it uses a 2.4 gigahertz transmitter/receiver. The camera right here is battery operated, uses a nine volt battery. Now, I do have one in there for demonstration purposes. It does not come with a battery. It has a nice, powerful, magnetic base, which can attach to the back of your vehicle or to the ball mount, like I showed you earlier. The camera right here is a hundred percent waterproof. It's rated IP68, which means it can withstand all weather elements, and the camera does have a hundred and twenty degree camera view. The camera will automatically shut off after fifteen minutes. Another nice feature is on the inside they have six automatic infrared night vision lights. It will give you thirty feet of vision in the darkest night, and around that they use built in foam around the lens to prevent any glare from those infrareds. The monitor right here is three and a half inch size monitor. It gives you a great view of the ball and any surrounding areas, plugs straight into your cigarette lighter. 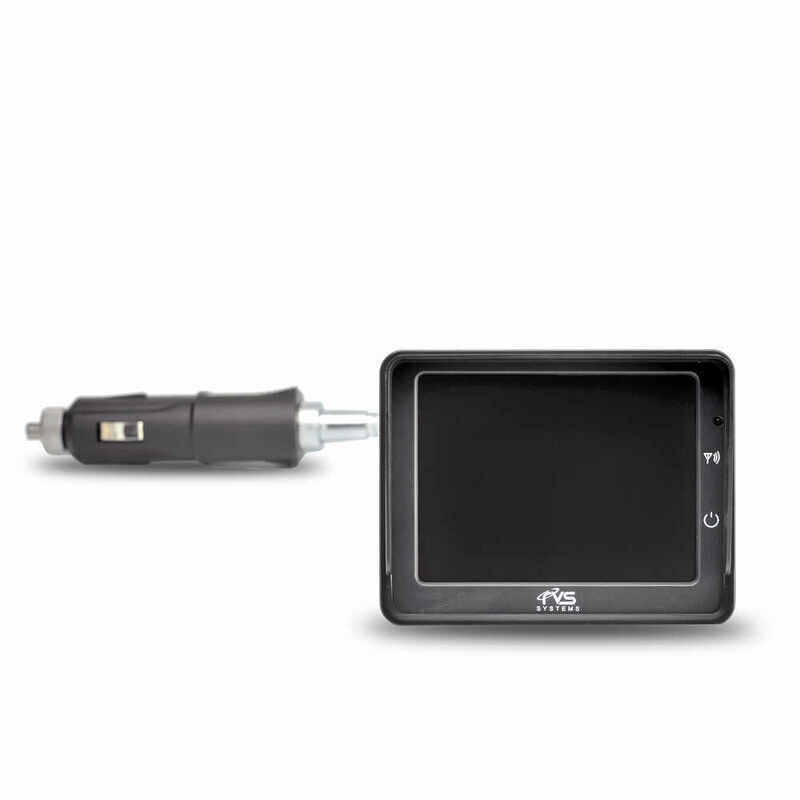 It has a flexible shaft to adjust the monitor to where you need it mounted. What I'm going to do now is give you a demonstration on how this would work. Again, we're going to pull our ball mount back up. Then to turn on your camera what you want to do, there's a button right down here. You just push that button, hold it for three seconds and then release it, and you'll see a steady blue light comes on. That means your camera is ready to go. Go ahead and attach it to your ball mount, and again, loosen it up. Direct your camera down to the ball mount. Then on your monitor I have a twelve volt power supply here. I'm going to go ahead and plug this in. Once the monitor is all plugged in, there we go, there's a bottom button and a top button. The top button is for pairing and the bottom is on and off. It's the same way if you hold it for three seconds and release it. You can see then the picture comes on. Then you see once the picture's on, let me zoom in just a little bit, and you can see there's your picture from the camera of the hitch ball. Makes it very clear to see. Now, what I'm going to do is go ahead and turn off the overhead lights just to give you an idea of what it's going to look like. Now, down here it's pitch black and you can see with it pitch black down here you still have a good view of the hitch ball because of the infrared lights. Now I'll go ahead and turn the overhead lights back on and we'll go ahead and . Again, to turn this off, let me just zoom out here, just again hold that button for three seconds and it'll turn it off. On your camera, again just hold the button three seconds and it'll turn the camera off. What's really nice on this is you can go back, pop this right onto your ball mount, go in, hitch up, go back, remove it from your ball mount, and you're all ready to go. Very simple, quick and easy. That should do it for the review on the Rear View Safety Wireless Hitch Camera. Ive had this camera for a year now. Used it about a dozen times. It always does the same thing, it works!! I tell anyone who asks to buy one and buy it from E Trailer. My camera is working just fine. As a mater of fact I used it yesterday. And perfect. ?? I am sorry to hear about any inconvenience with your order, Dustin, and have forwarded your comments to our customer service department. I see that they are currently working on a resolution to replace the defective product. 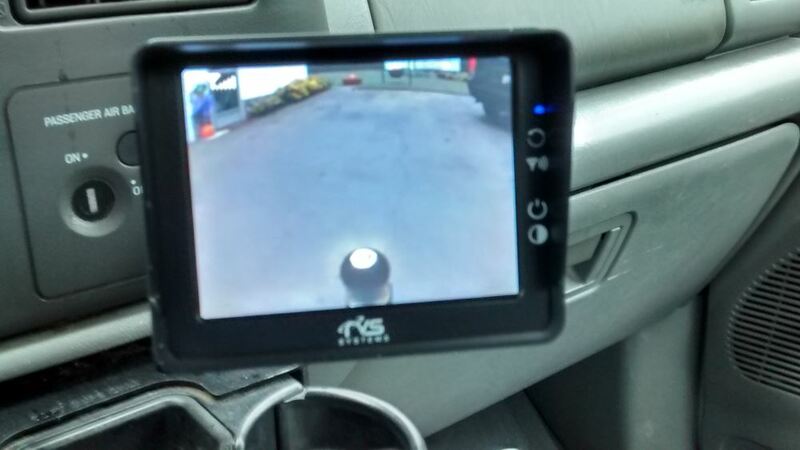 Rear View Safety Backup Camera System # RVS-83112-WIFI is the way I would go. The reason is that WiFi is less likely to suffer from any interference issues like other wireless systems. This system will work with iOS and Android devices. This is another advantage because it means that you won't have to have a separate monitor mounted like you would with # RVS-83112. I have included a link to the installation details for you. Yes, if you put the camera of the Rear View Safety Wireless Hitch Camera # RVS-83112 at the rear of a trailer you would be able to see where it was going while backing up so that would work for you. 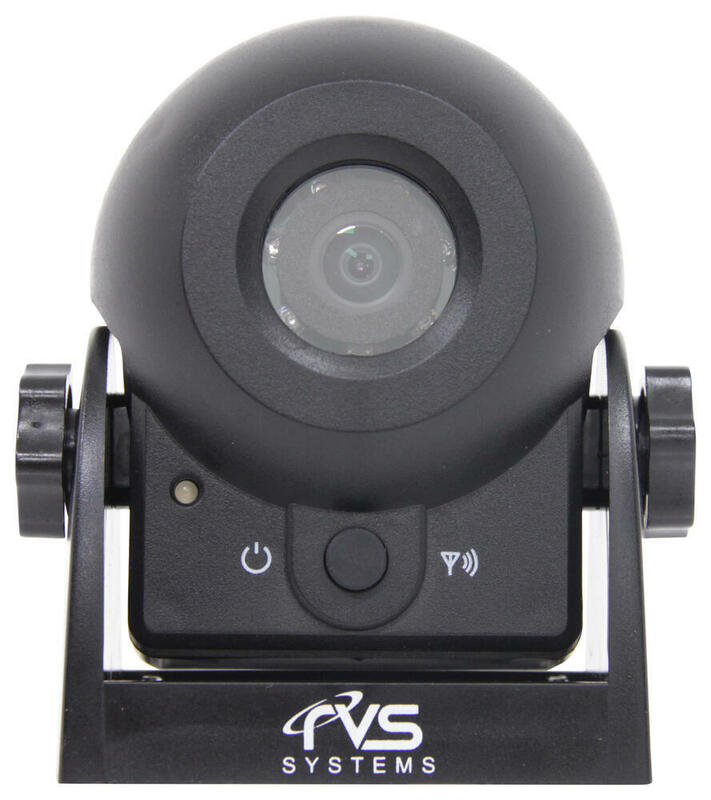 The camera in the Rear View Safety Wireless Hitch Camera System # RVS-83112 has an automatic 15-minute shut-off feature on the camera to conserve the power in the 9V battery that powers it. Battery life is 3 to 5 hours. The monitor part takes in 12V power from an outlet in the tow vehicle so it remains powered. There is a safety concern with having a camera system engaged at all times; it can become a distraction from your primary concern, which is the road in front of you. 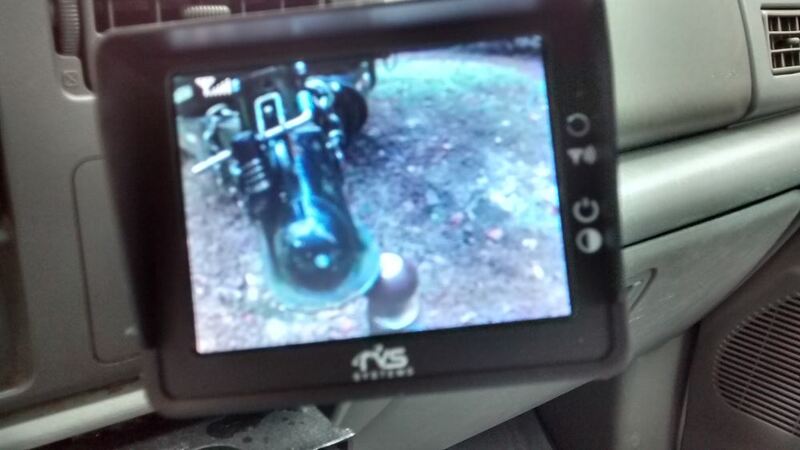 The Rear View Safety Wireless Hitch Camera # RVS-83112 does not turn on when you power on the monitor. You will need to turn the camera on when ever you're hitching up to your trailer. The dimensions of the camera itself are 3 inches wide by 1-1/2 inches deep. It's also 4 inches high. 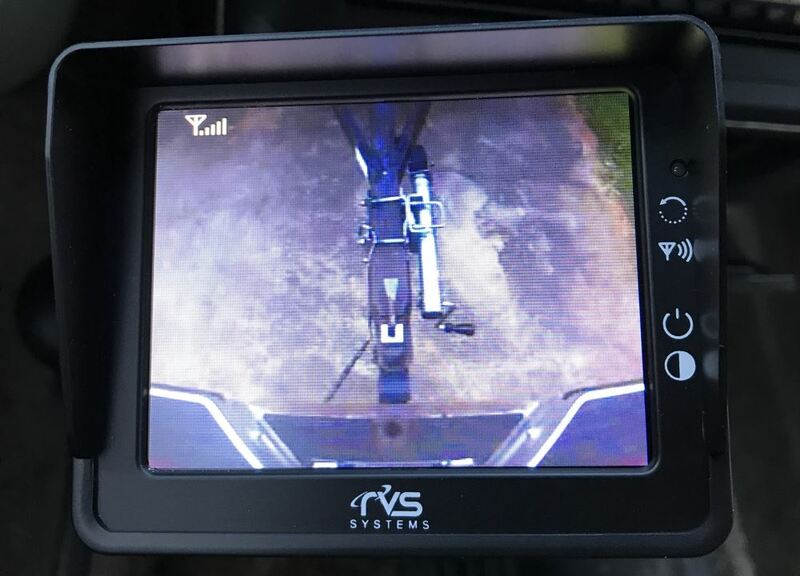 All of the wireless back up camera systems we offer are a really easy installation but do not plug into the 4-way trailer connector. 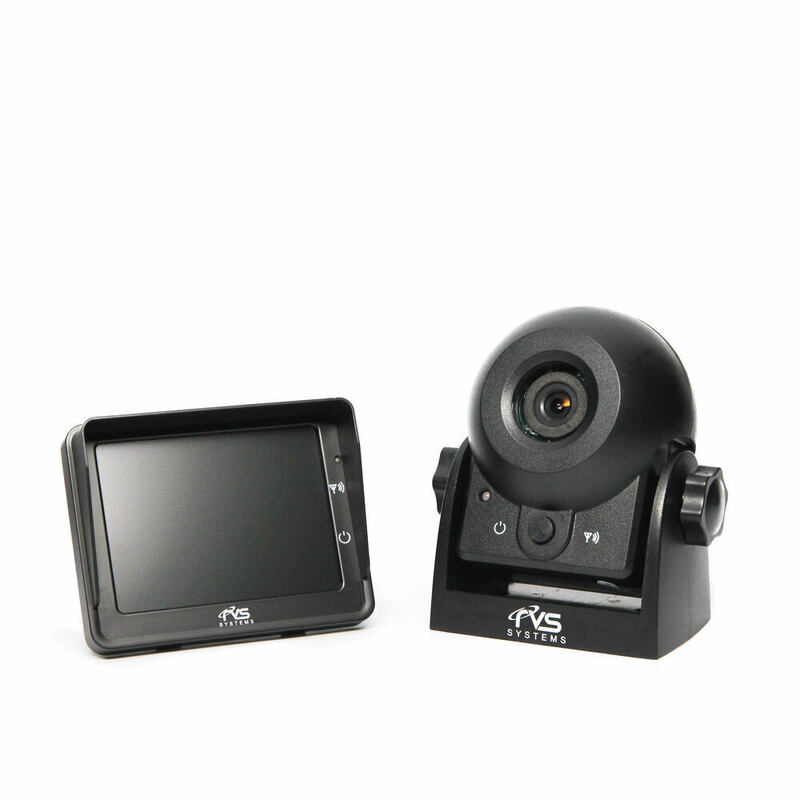 A system like the Rear View Safety Wireless Hitch Camera, part # RVS-83112. 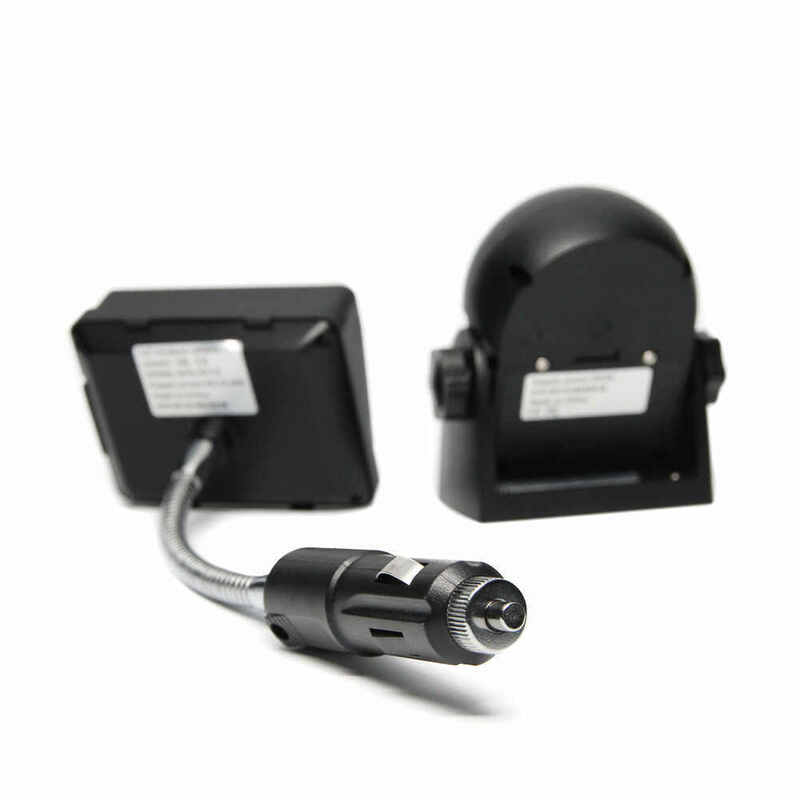 The monitor plugs into a 12V outlet and the camera is powered by a 9-volt battery. 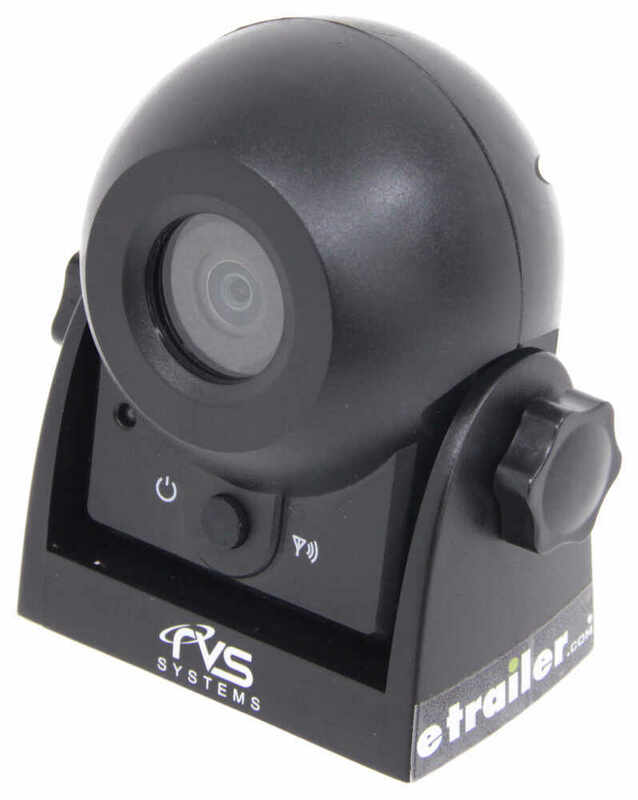 The Rear View Safety Wireless Hitch Camera # RVS-83112 has a 120 degree viewing angle and provides connection for distances up to 70 feet. It can be adjusted to see all the elements you stated as you back up your large pop-up camping trailer. It has infrared to even give you 30 feet of viewing at night. This system will work very well for your application. It will automatically shut off after 15 minutes so you just want to be aware of that time frame when using the camera. 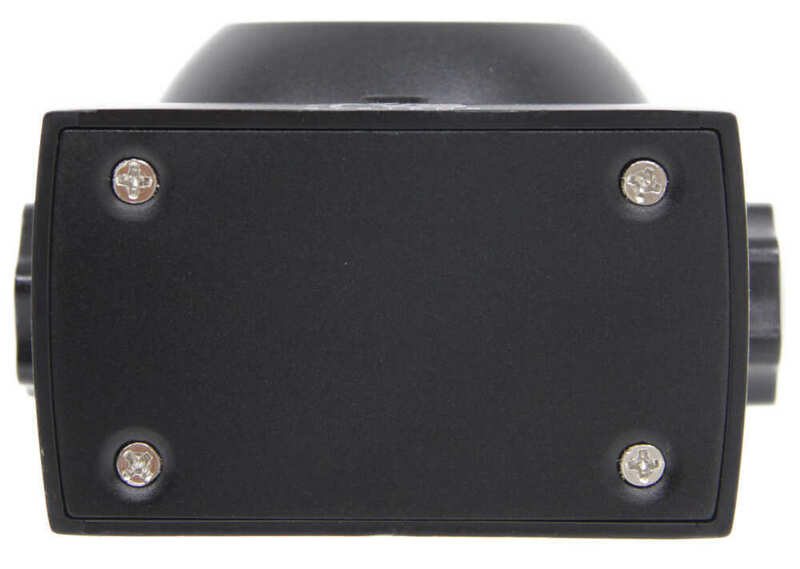 The Rear View Safety Wireless Hitch Camera # RVS-83112 has 6 Infra-Red lights to give you 30 feet of night vision. This will make it so you can hook up in the dark. I've attached a couple videos for you. 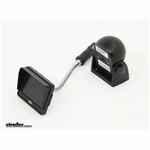 You could use a magnetic mount camera such as # RVS-83112 placed on the hitch or ball mount if you wanted to. 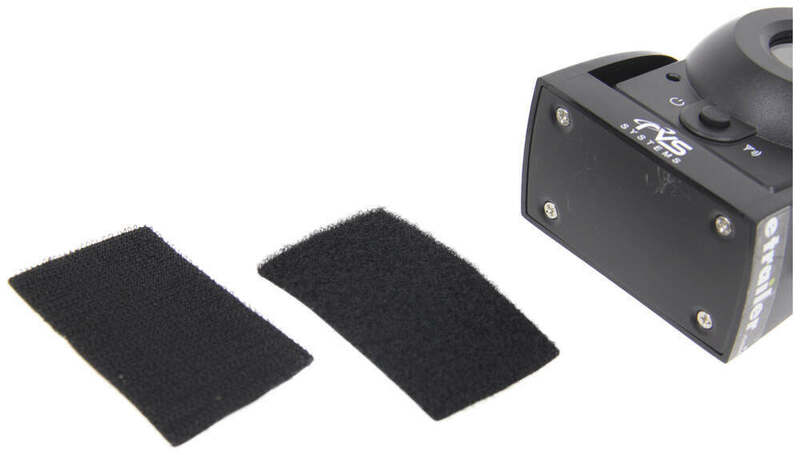 Otherwise you could use a license plate frame style camera such as # HM60195VA. A magnetic style is great if you have more than one vehicle you want to use it on. The license plate camera has the benefit of being a hardwire installation instead of wireless so there is little to no chance of interference. The Rear View Safety Wireless Hitch Camera, part # RVS-83112 you asked about is not designed to work with a smartphone or tablet. We do not carry any systems that is capable of using both a monitor and a smartphone. Rear Safety also makes the # RVS-83112-WIFI. 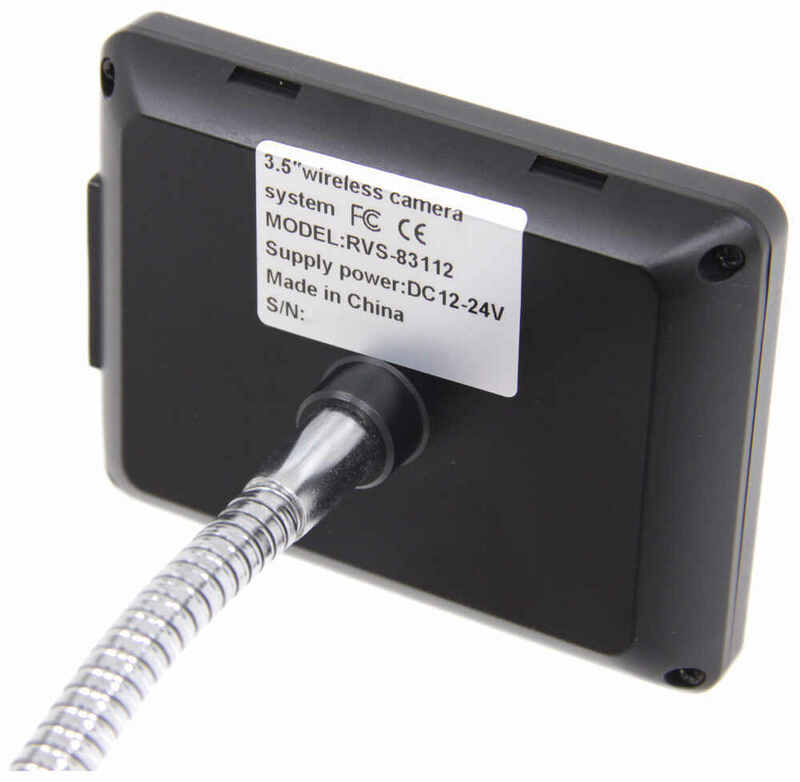 This system uses a WiFi signal to allow you to use a smartphone or tablet to receive the signal from the camera. The transmitter on the camera creates a WiFi network that will work with the Safetyeye app you can download for free. Yes, the blue light blinking in the upper right corner of the screen on the Rear View Safety Wireless Hitch Camera # RVS-83112 is normal. If you check out the review video I attached at 1:35 mark you'll see the blue light blinking as well. 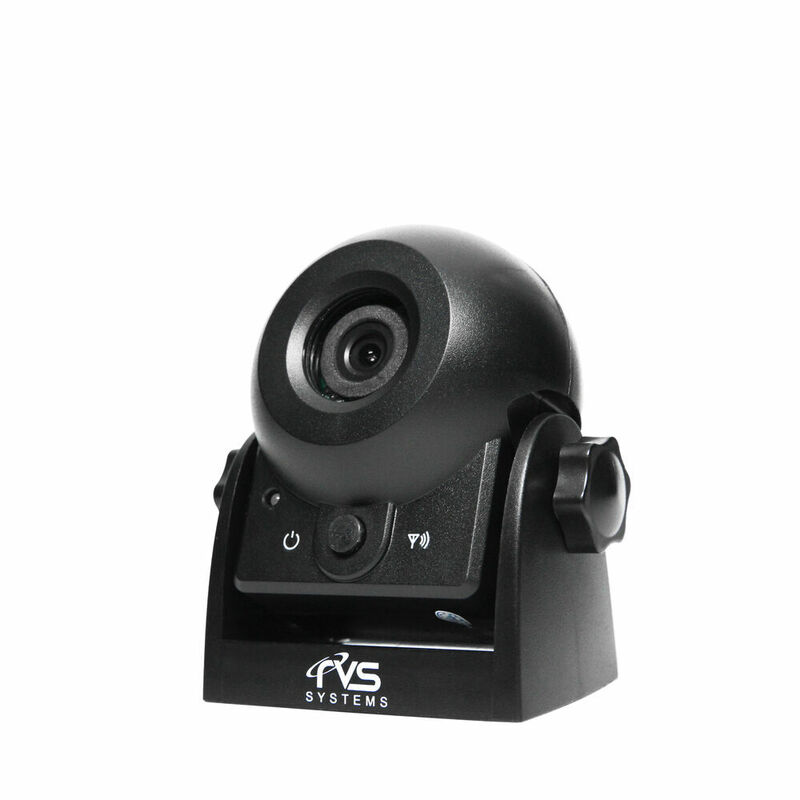 The battery life for the Rear View Safety Wireless Hitch Camera # RVS-83112 is estimated at around 3-4 hours, but will vary based on how many times the camera is used. My technical contact at Rear View Safety was able to tell me that the camera is designed to turn off after 15 minutes to conserve the battery power. The exact battery life will depend on the battery used, outside temps, how many times the camera is turned on and off, and how long it is used each time. 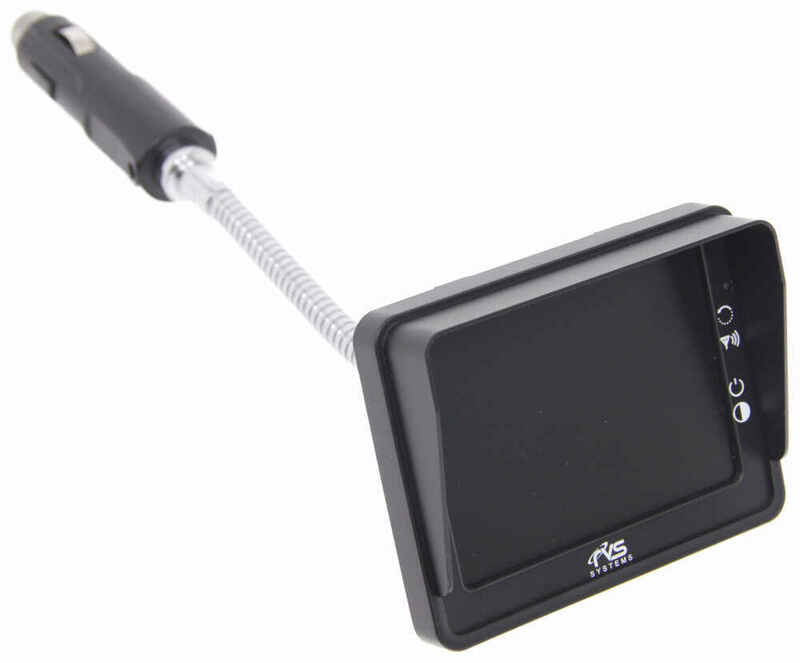 We haven't gotten great feedback on the range of the Rear View Safety Wireless Hitch Camera Item # RVS-83112 that you referenced so for your needs of 50 feet this would not be what I'd recommend. 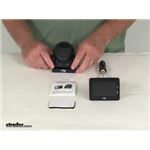 I'd instead recommend the Furrion Wireless Camera kit part # FOS43TASF which I realize is a significant increase in price, but for the longer transmission range you have you'll need something higher quality like this which I can easily guarantee will work well for you.